Fallen Earth is out and there has been quite some feedback from players. However, it's not usual that the feedback concerns the look of female characters in the game. The developers listened to players' cries and decided that some changes were in order. Chris Allen, the game's artist, made adjustments to the facial models in order to differentiate the females a little bit more from the male character models. The changes were introduces in a recent patch. Female models now feature less excess skin in the chin, the nose has been streamlined and lips lifted, among other changes. 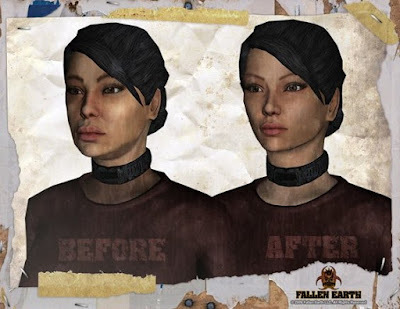 These are still far from the idolized beauty model, but the post-apocalyptic women on Fallen Earth are definitely looking better than before.